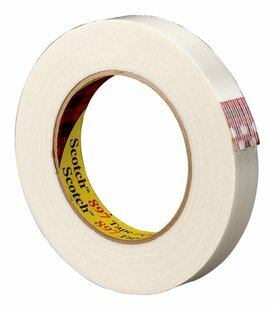 Scotch® Filament Tape 897 is a high performance fiberglass-reinforced tape for use in light-to-medium duty bundling, strapping, reinforcing and palletizing. The synthetic resin has been specifically formulated for adhesive bonds with minimum rubdown, and the polypropylene backing provides excellent resistance to nicks, abrasion, moisture, and scuffing. Strong 170 lbs/in tensile strength for light- to medium-duty bundling, reinforcing, and palletizing. Specially formulated rubber resin adhesive bonds to fiberboard, plastic and metal surfaces. Polypropylene backing gives excellent resistance to nicks, abrasion, moisture, and scuffing. Low 3% elongation at break helps keep tight bundles. Fiberglass-reinforced for highest strength possible.